This is the one we decided on. It is a classic style with a slightly nubby linen that is somewhat more formal than casual. 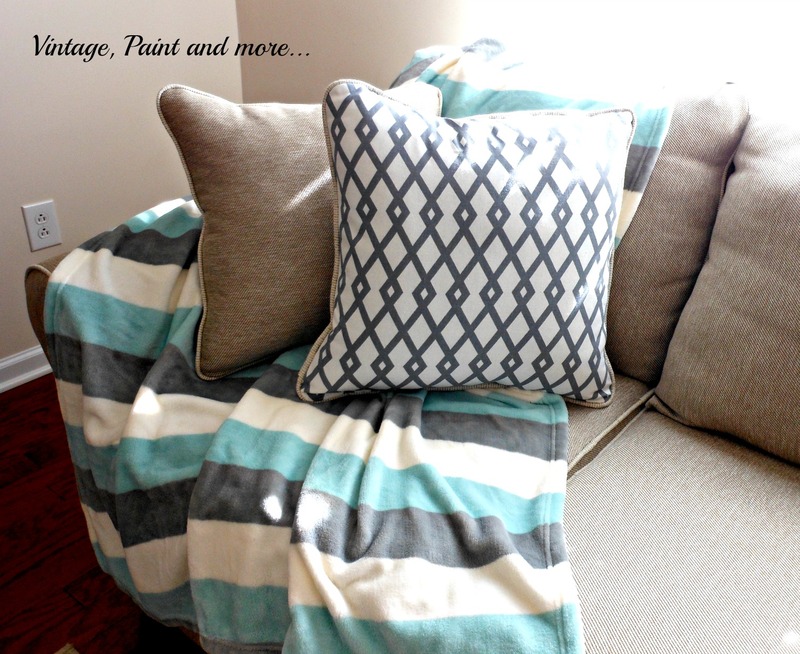 We decided on a neutral tone so we could change up the mood of the room with pillows, blankets and accessories. I would call this a "greige" with cream piping. The pillows that came with it have a basic gray design in them. 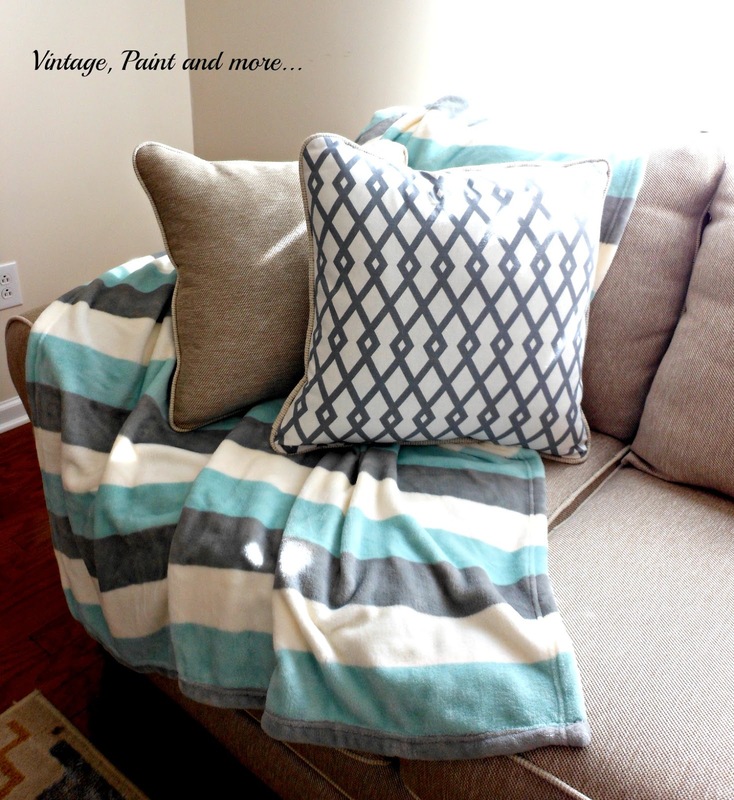 I found this blanket at Marshall's that has the exact colors we want to use in this room - Caribbean blue, a medium gray, and cream. This is what I refer to as a coastal or "beachy" color palate. I think this will be a nice soothing and comfy palate. We are deciding on the color to be put on the walls at this time - they will be a gray also but the shade is what is the problem. We are down to two and I think we are leaning more to one than the other. But, with the weather still being quite cool we won't be painting for a while so we have a little time to decide yet. We'll just continue to get our basic (bones of the room) pieces put into place for now. I think we have a good idea of the direction we are going in. Can't wait for the weather to break so we can start painting. What is your favorite color palate? Please tell me about it in the comments below. Thank you for stopping by. Have fun this week creating something you love. Love the colors! My parents have a similar colored couch. I'm going to show my mom these colors. Thank you. Love the new sofa...the color is perfect! I am looking for a sofa too! Love your choice- looks great! I love it! You can pair with any color and just about any theme. Great choice! I love the colors in the blanket too. 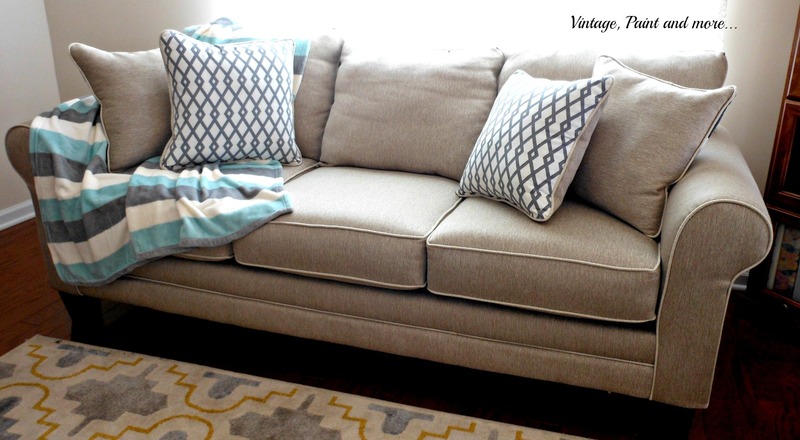 I love a neutral sofa, so many options! The blue is a great pop! Love the new sofa, great color! I like it, I kinda regret buying a black couch myself. cheap ray bans australia because that is cheap ray ban wayfarer sunglassesthe idol, often said one day to get autographed photos of Miss freezing rain, and then hung on the wall every day to worship. cheap ray ban aviators sunglassessale very deep to say, and then cheap ray bans australia covered with chrysanthemums, immediate rage. You also know that Ann cheap ray bans australia freezing rain. cheap cheap ray ban sunglasses asked, surprised. Of course, I'm very fond of . Would you mind posting where the couch is from? This is exactly the kind of couch I'd like to get but I haven't found one like it yet. We purchased it at Rooms to Go.